Perched on a gentle hill, a short drive west of Perth, Ontario, the ‘Stafford House’ has become known as one of the area’s most celebrated fictional houses. 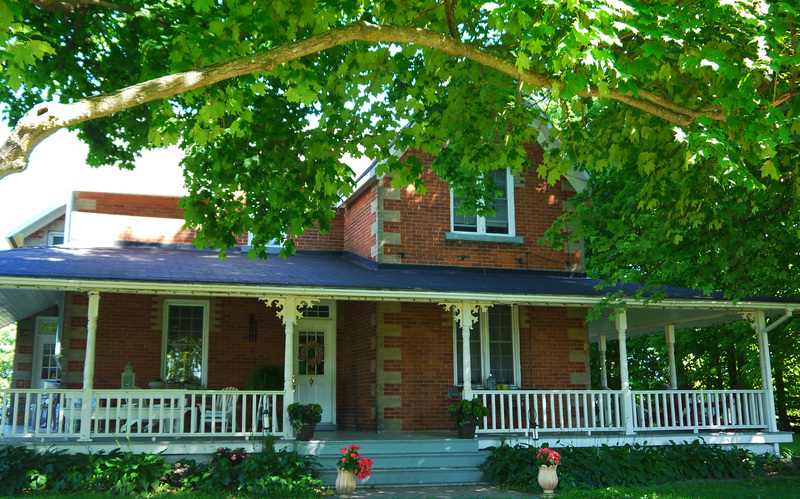 It is one of the best examples of a building associated with a Canadian author, Arlene Stafford-Wilson, who used the farmhouse as both the inspiration and the setting for her popular books. Built in 1906, the two storey house, a warm and welcoming residence, was home to the Stafford family for almost 50 years. This traditional, rural home would become the backdrop for four well-loved books: “Lanark County Kid”, “Lanark County Chronicle”, “Lanark County Calendar” and “Recipes and Recollections”. The Stafford House is valued both for its good aesthetic and functional architecture. Its farmhouse design, places it firmly in Canadian vernacular building traditions of the earliest part of the 20th century. It is of an appealing, sturdy type, very common to many areas of eastern Canada. The interior of the house boasts a classic, traditional design, featuring good craftsmanship and materials. The interior plan finishes and details have been lovingly preserved, and its overall scale and materials, are enhanced by its setting in a park-like yard, surrounded by stately maple trees. You will be charmed by the beauty of the surrounding countryside, and the large and romantic woodland which drifts down the hillside towards the railroad tracks, and the beloved duck pond, mentioned many times in Stafford-Wilson’s books. Close by, you can take a walk or a drive down the side road and see the little creek where the Stafford children caught tadpoles in the spring, and then walk along the fields where they carefully chose their Christmas tree each year in December. View the rolling farmlands, stunning landscapes, and nearby tiny villages of Glen Tay and DeWitts Corners. Take a short drive up Cameron Side Road, and you will see the charming red brick Calvin Church where the Stafford family attended, another landmark which is mentioned many times in Stafford-Wilson’s books. This year, for the first time, you can visit the Stafford House in Eastern Ontario, Canada, the setting which was the influence for Arlene Stafford-Wilson to create her beloved tales of Lanark County in days gone by. Special exhibits include photos from the private collections of the Stafford family showing the exterior and interior of the house as it was, when they lived there from 1946 – 1992. Admire some of the author’s Mother’s original hand-written recipes that were preserved, then later published in ‘Recipes and Recollections’. Take this extraordinary glimpse into this beloved home of author Arlene Stafford-Wilson and her family, decorated for the holidays. A visit to this historic home will be sure to put you in the Christmas spirit. Organized by the Perth and District Canadian Federation of University Women, the Heritage Perth Christmas House Tour will feature 8 local homes including the Stafford House, transformed for the holiday season by gifted local decorators. This ninth annual Christmas House Tour is scheduled for December 6 and 7, 2014 from 10:30am to 3:30pm daily and is sure to delight. This entry was posted in Historical Interest and tagged Arlene Stafford-Wilson, calvin united church, Canadian Author, Canadian Federation of University Women Perth Ontario, DeWitt's Corners, Glen Tay, Historic buildings Perth Ontario, Perth Christmas House Tour, Perth Christmas House Tour 2014, Perth Ontario, Recipes and Recollections, setting for Canadian book, Stafford family history Lanark County, Stafford House. Good morning Arlene , that is a grand picture of the Stafford house,,,, will be great for you to call back to your old homestead at Christmas .. Thanks Tom! Yes, lots of memories I’m sure – trudging through the snow across the fields behind the old house searching for the perfect Christmas tree, toboganning down the hill in the west field with Roger, and Dad standing precariously on his step ladder stringing lights around the big spruce. Not to mention all of Mother’s delicious Christmas baking! It’s a lovely time of year to visit!